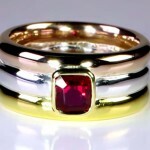 This is a very unique Trilogy ring made with three metals namely Fine gold, Red gold & Fine silver along with a very fine quality square cut RUBY set in it. This ring is especially effective and powerful to combat and neutralise the Mangleek factor and at the same time it serves to raise your Sun, contribute to your mind’s quest for enhanced knowledge, raising mental and physical strength, protection from nervous disorders & health issues linked with nervous system, recharging mind, body & soul and advancement of your technical abilities. This Ring is an absolute must for all natives in whose’s charts Sun is prominent but its position is negative or effect is zero. Natives with a profession that involves strategy, research, legal aspects and direct dealing with public would do well to wear this ring for continued and increased success and happiness.